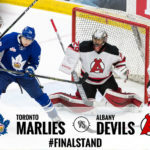 TORONTO — The North Division Final has lived up to the hype and that’s what hockey fans and the American Hockey League desire. 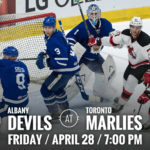 The second round matchup between the Albany Devils and Toronto Marlies requires a Game 7, which will be played Monday at Ricoh Coliseum. In case you need a refresher, the Devils and Marlies had the two best records in the Eastern Conference. 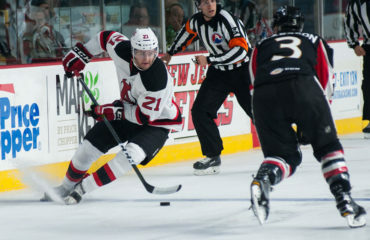 Toronto won the regular season title, while the Devils finished third overall. 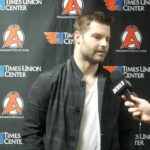 Albany won Games 1, 3 and 6, while Toronto took Games 2, 4 and 5. 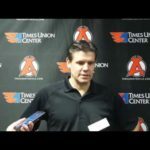 Monday’s game will be the first Game 7 in Devils’ history and the third Game 7 in Albany’s AHL history. The Devils hope to ride the momentum from their 4-1, Game 6 win. The Devils continued to keep their practices light between games. Only a small group skated Sunday at Ricoh Coliseum. Jim O’Brien and Pavel Zacha, who have not played since Game 1, were among the group. Brian O’Neill and Mike Sislo did not skate. 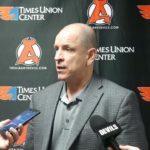 O’Neill missed Game 6 and Sislo sat out Games 5 and 6.